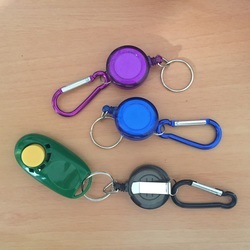 Keeps your clicker safe and easily to hand when training. Extends to about 60cm and retracts back automatically. Clip it onto your treat pouch or a belt loop or your sleeve so you can just grab, click and drop.